For PDF version of this chart click here. A sub-section devoted specifically to the TNRD-managed Spences Bridge Waterworks is accessible from the sidebar or from this link. You are invited to submit open letters, articles, videos, links, photos, etc. regarding this political entity. Remuneration chart for all of TNRD here. TNRD Main Website here. Spences Bridge Water System here. The Thompson-Nicola Regional District provides an on-line Public Record Request form. You may make a request for access to records via this link. Illegal Dump Site Reporting. Submission form here. Provide the political and administrative frameworks necessary for member municipalities and electoral areas to collaborate in the provision of regional and sub-regional services. At present, the Thompson-Nicola Regional District has 25 Directors, comprised of 10 Electoral Area Directors and 16 Directors representing member municipalities. Each Electoral Area Director appoints an alternate to provide voting representation at Board and Committee meetings in their absence. The following postings are listed in chronological order with newest posts at the top. The Thompson-Nicola Regional District wants online voting to be made available to local governments in B.C. for upcoming elections. Read article here. OCTOBER 11, 2015 TNRD to conduct review of Spences Bridge Water Tax. OCTOBER 6 , 2015 TNRD to adopt biosolids bylaw. JUNE 16, 2015 HISTORICAL DOCUMENT: Bylaw # 2087 to establish a community water system service within a portion of electoral area “I”. View document here. 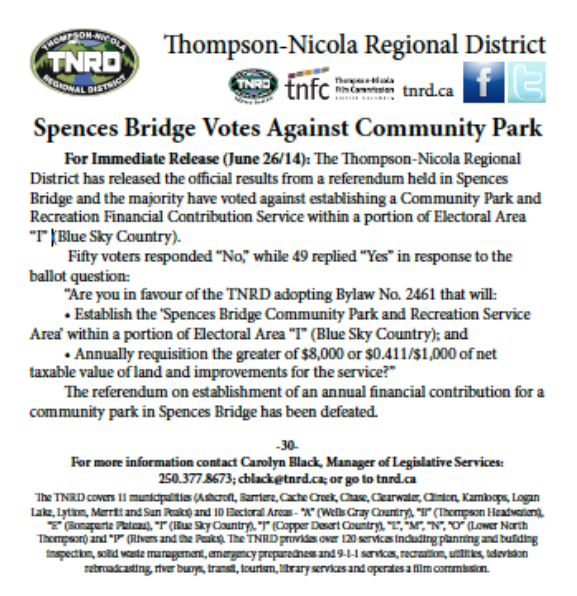 JUNE 10, 2015 TNRD presentation in Spences Bridge re water system rate increase. Listen to the complete audio recording of this well-attended 1 hour meeting here. MAY 25, 2015 TNRD looks at options for regulating biosolids. Read article here. 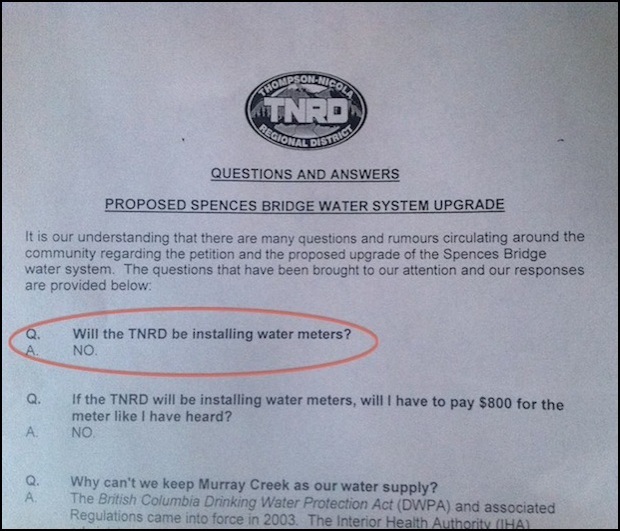 APRIL 3, 2015 HISTORICAL DOCUMENT: TNRD information document released prior to water system switchover from Murray Cerek declares that NO WATER METERS WILL BE INSTALLED. MARCH 25, 2015 TNRD Free Disposal Day 2015 schedule here. JANUARY 6, 2015 TERESA WILD RESPONDS TO JANUARY 15, 2015 CBC INTERVIEW REGARDING SB IRRIGATION WATER. Listen here. 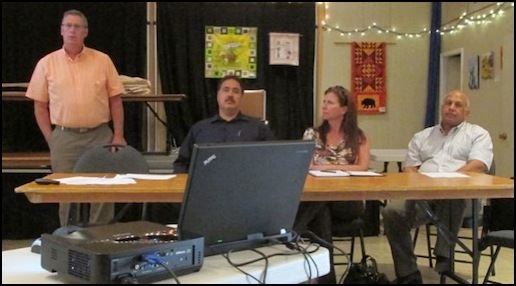 JANUARY 5, 2015 CBC’s Shelly Joyce from CBC Kamloops interviewed Spences Bridge land owners re the possibility of establishing an irrigation water system in the village. Listen to audio (2 parts). Part 1. Part 2. DECEMBER 30, 2014 TNRD DIRECTOR PAY SCHEDULE online document. Read it here. DECEMBER 30, 2014 TNRD WATER SYSTEM ACQUISITION & SUSTAINABILITY STRATEGY online document. Read it here. NOVEMBER 21, 2014 TNRD Regional Growth Strategy online document. Read it here. TNRD Bookmobile comes to Spences Bridge every three weeks on Thursday, 4 -5 PM at Post Office. 2015 schedule here. First visit in 2015 is Thursday January 15. Used oil accepted at more TNRD waste facilities. Click here for more info. By acclamation, Steve Rice retains 4 yr. position as Regional Director for Area I. 2014 General Local Elections in BC will take place November 15, 2014. Candidate's Guide to Local Government Elections in B.C. • as required by the .....[applicable Act]....., I will disclose any direct or indirect pecuniary interest I have in a matter and will not participate in the discussion of the matter and will not vote in respect of the matter. Want information regarding the upcoming Park Referendum? The link supplied by the TNRD gives you a web page shown in the following screen shot. No referendum information here though, only the title. It takes you back to where you started………. Hands up if you want to pay for even MORE government services like this? The management at the TNRD is not interested in holding a simple non binding survey to determine who would like Murray Creek irrigation water in Spences Bridge to irrigate private and business properties as well as providing back up water in case of a fire. As you well know, the current water system is under pressure due to improper engineering design parameters along with excessive temporary uses by corporations, illegal SBID watering and other factors such as leaks. If an electrical failure occurs and Railways or other factors cause a reduction in stored water in the reserve tank simultaneously, Spences Bridge could have a fire security risk. Just think of a senario where a Railway Corporation is sucking 30,000 gallons out of the water reserve tank, then the power fails, and a massive railway sparked fire flares. I think you understand what can easily happen in this risk management scenario. The water may run dry while the town burns. Logically, as I am sure you are aware, having an additional active irrigation system is far better for risk management fire protection in Spences Bridge than what is currently only available in terms of fire fighting infrastructure. Additional water hydrants for fire fighting could be added to an irrigation water system to expand fire fighting coverage. Such a system may even save lives. This is something the SBID trustees and Fire Department should appreciate. If they don't there is something really wrong with their judgement. Since the TNRD management is not concerned about the community as much as other people, I request that you Direct the TNRD to conduct an irrigation demand survey or you conduct it with your Director budget "tools". After conducting the survey and observing the results, I then would request that you hold a meeting to determine if there is a real appetite for the water and gain ideas as to how the water can be delivered and paid for. Pretty simple stuff for the most part as you can see. I have been told by the TNRD that water meters are coming. People will pay up to $2/ cubic meter for water as per water utility rates found in the TNRD water by-law. Water meters are a Government welfare tax scheme that most people in town want to avoid like the plague. Irrigation water will hold back that plague potentially if you Direct such action if it is economically feasible. The TNRD will not lose the water licences on Murray Creek if it is Directed properly, by you, in this matter. In fact, the TNRD will benefit greatly if the water flows for irrigation. If you want the TNRD and SBID to benefit, hold the survey and meeting. You will learn a lot as to how this is win win situation will provide economical and political benefits. You can potentially Direct this situation to an economically smart solution that will benefit people since the Management of the TNRD does not have enough concern about the matter or the community. 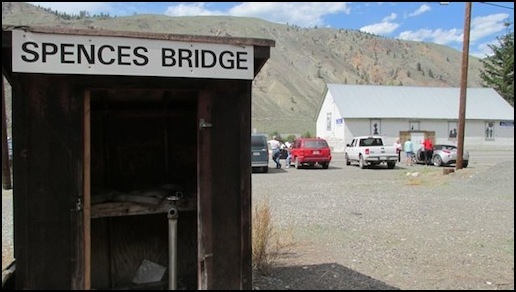 Show your political concern and service for Spences Bridge. Hold the irrigation survey and meeting. 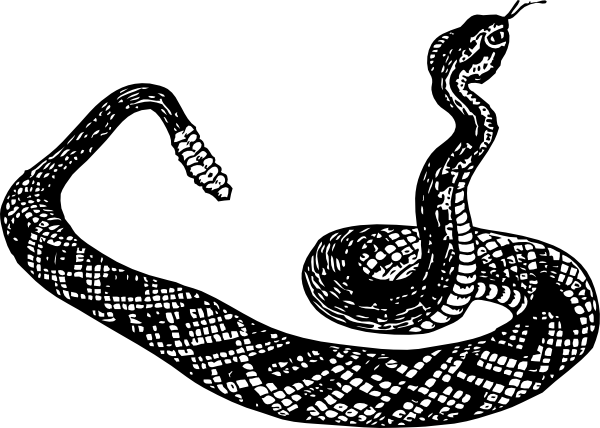 One other course of political action involving the media exists if you refuse. After that, the Spences Bridge Murray Creek economic comparative advantage may be lost for ever. This historical period,dating back to the 1870's will be ended along with lost economic opportunities associated with irrigation here. Rest assured, this could lead to political "fall out" and publicity that politicians may not want to face. Do you want to be responsible for the loss of this historic economic comparative advantage that has brought this town jobs since the 1870's? Show your political skills with a survey and meeting. Time is of the essence. As such a mailing operation can be launched very quickly, interested people in this community expect your response to the survey undertaking this week. Contact me by email with a response this week. Thank you and I look forward to your email response and a constructive meeting with you and others over this issue so that we may all learn more. Would you like irrigation water supplied from Murray Creek for irrigating your property and providing back up fire protection (or would you like a water meter instead)? 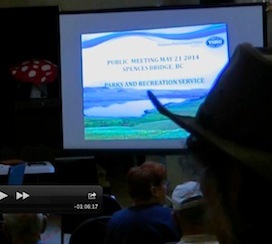 May 21, 2014: Audio File of TNRD Information Meeting held in Spences Bridge on May 21, 2014. What’s a referendum? Click here for more information.